While seeing all the recap posts for this years these two days, I didn’t feel it ends until today. On my way back to Belgium now. I’m sure you guys all enjoyed using steemhunt and @tasteem, it was great to meet the founders of these two awesome apps, @project7 and Travis. Victoria @bugavi and Olga @olga.maslievich, I was following your story of travelling to Poland from you getting the visa to the bus trip on Steem and it was great to meet you two in person. And Victoria, your English is good, you don’t have to worry. @anahilarski, I hope you guys enjoy your Eurotrip and all the best with future project! @steemcafe, you are always great fun. @stoodkev, you too, so much fun! See you in Tainan! CN community gathering! @crypto.talk @partiko @travelgirl! You are a star @coruscate, it was so great finally meet you in person! @world-travel-pro, that “travel pro” selfie finally! @greencross @kevinli @steemmatt, why’s this photo like this, whats wrong with the color? 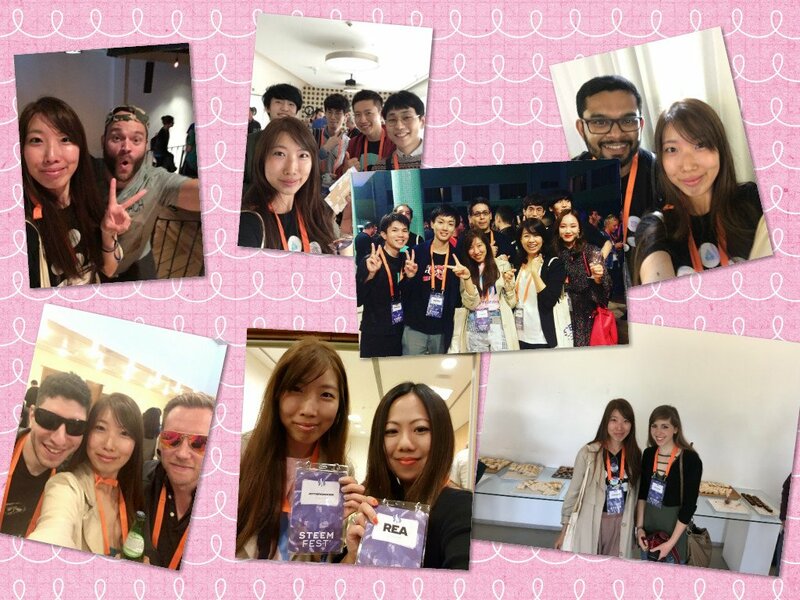 I’m happy that I had to extend my trip to spend some time with Team Malaysia, @joannewong @elizacheng @bitrocker2020 @aaronleang, you guys arr awesome, I hope to meet you guys in KL maybe next year? Of course not to forget te legendary @nathanmars and @ddaily fam! Nice meeting you guys and sinxe I love travelling, maybe see you guys somewhere. My Steem Ambassador Application – bring Steem everywhere in the world! After I read my Steemit friend, @future24, was applying Steem ambassador yesterday, I feel it’s a great idea, look at how amazing his post is! Now I decide to apply for Steem Ambassador myself. In case you don’t know me, I’m Joy, born in China, living in Belgium, with a background both in IT and tourism. I’m happy I discovered Steem two years ago and started a lifestyle of travelling and promoting Steem everywhere I go. Me, Steem and Rock Werchter, you can find the full festival report here and my live streaming here. I’m lucky to have a happy and comfortable life, during my first 2-3 years stay in Europe, I’ve travelled to every single country in Europe. Recently years I get more interested in travelling to less developed regions, which, in tourism, we call “Global South“. I’m always fascinated how different life can be and how amazing people are all over the world. I think it’s easier to get people there to start using Steem. In many countries, a 2ish$ payout can buy a meal or even more. Big shoutout to @surfyogi and his @wafrica project. West Africa is an area I always want to visit and I’m going there this year, tickets already booked! Looking forward to meet @mcsamm and Ghana team! At the moment, I’m also slowly planning a world trip, thinking it could the best chance for me to promote Steem worldwide. Having fun with Steemians last at SF2 in Lisbon, I believe this year SF3 is going to be awesome as well! I just booked the ticket the other day to Krakow, which means I’m on the roadtosteemfest. To sum up, this is my Steem Ambassador Application above. I’m looking forward to promote Steem to more people all over the world!